Bella Vista Sul Lago Argegno is a newly refurbished property boasts spectacular views overlooking both lake and mountains located in the sleepy fishing village of Argegno, considered one of the most authentic and attractive villages with easy access via ferry, bus or road to reach the more touristy villages dotted around the lake with ease. The interior of this detached home is light and fresh which has been tastefully decorated and furnished throughout. The wine bars serving authentic italian varieties of wine are frequented by locals and Italian's from further afield who arrive on the weekend to sample the local flavour and atmosphere. Sunday morning is popular here in Argegno as the cyclist and motorcyclists descend on the village to enjoy a coffee, glass of wine or ice cream from the fantastic geletaria ice cream parlour housed in the centre of the village. A small convenience shop and fishmongers conjures up images of a bygone life in this medieval village. A local supermarket is also found only 10 mins away by car/ bus. Complimentary toiletries and chilled prosecco for all guests available on arrival..
Stay with us at Bella Vista Sul Lago Argegno and you will fall in love with the view that you wake up to every morning and watch the sun go down each night, alfresco or on your private terrace. Please do not hesitate to contact us for more details. Room fans, fire extinguisher, first aid kit included. The fire extinguisher, first aid kit and a flashlight can all be found in the kitchen. We relocated to the lake in 2007 from the Uk and live locally so are on hand whenever our guests need to get in touch! By renting your holiday home with us you can be sure of gaining the inside track to the lake and local's view to ensure you get the very most from your stay and enjoy a local experience second to none. By staying here with us we can recommend where to eat with the locals, hire a boat at the most competitive cost, show you the hidden places with the locals shop from finding the freshest baked bread to the best markets to the trattoria's where the Italian's dine away from the tourists or the very best bar's where the tastiest snacks keep coming with the drink's! If you need to hire a scooter or cycle, find the best hiking routes, or pathways around the lake for scenic walks we will point you in the right direction. The photos and views speak for themselves. The 180 degree panoramic lake views are simply sublime. The home is located over three levels and affords spacious living inside and out on the private terrace. Easy off road parking and just a 10 minute walk down to all amenities from restaurants and bars to ferry and swimming pool at the lido in the village centre. Hence the wonderful reviews received! The home is located in Argegno, a gem of a village. There is a real local feel to the village. Meandering cobbled paths, local market's with superb local produce and seasonal ingredients, a wonderful brand new lido to take in the sun and swimming pool to cool off, a cable car to the mountains to take in more majestic views, authentic wine and cafe bars and superb home made gelateria to name just a few highlights. In short we offer more then letting our holiday home. We offer a unique insight into living like a local here on the lake to ensure you get the very most from your stay from the minute you arrive ensuring an unforgettable and personal experience. Refundable precautionary 350 damage bond due on arrival refunded on departure in full. We politely request our guest to remove recycle responsibly and refuse waste on departure. toilet, combination tub/shower, Bath tub with overhead shower attachment. Bath and hand towel included for every guest. Dine inside or alfresco to wonderful lake views. Balcony adjoining with two double bedrooms, ideal to wake up to the lake as you breakfast or enjoy a glass of wine as you watch the sun set over the lake. Spacious private lake view terrace for relaxing, sunbathing and dining. Tennis court available 15 minutes from the home. Golf course available 25 minutes from the home. Home located over 3 levels which may deem the home unsuitable for elderly, infirm or young children. Please check prior to making your reservation. This was a wonderful home to stay at, and perfect for relaxing after spending time in busier parts of Italy (Rome/Florence). The view is stunning, and the home is very clean and comfortable. The owners have excellent suggestions for enjoying Argegno and other towns on the lake. If I'm ever back, I'd love to stay here again! The flat is very well located, comfortable and clean. The view over the Como Lake is more than agreable. Thank you Bill for your review. We are glad you enjoyed your holiday here in Argegno and that your stay provided a heart warming memory for you. We agree it is a special place with lovely people and a charming atmopshere. We do recommend hiring a car hire as it is approximately a 10 minute walk down to the village and naturally the walk is longer back up the hill! We have guests of all ages, from 8 to 80 years, that stay here and many, like yourself in their 70's, manage to walk up the hills each day, just like the locals that live here. It also helps to walk off the delicious Italian food and wine, that's my excuse to indulge anyway! I am sorry the communication wasn't as smooth as we would have liked for your arrival. This is very out character for us as you can read from all our previous reviews here online. We communicate to all our guests ahead of their stay to call us one hour ahead of arrival in order that we can meet our guests on arrival in a timely fashion and as suggested prior to your stay. Unfortunately as you did not have a phone and did not call us from a bar in the village, and then waited for us at the wrong address we had no means of communicating with you and are sorry your check in was subsequently delayed. We provide a complimentary welcome pack with food and wine on arrival for guests stays, as we did for yourselves. We also offer for all guests stays an additional grocery shopping service with all your favourite food items delivered ready for you to enjoy on arrival which saves you the trouble of having to go shopping, especially if like yourself you preferred to arrive without a car. There is a weekly market as well as a convenience store with essentials, and fishmongers and a sweet store. Thank you once more for taking the time to share your experience and how much you enjoyed your stay. Stunning views. A wonderful, relaxing holiday! Bella Vista Sul Lago is perfectly named. Its a beautiful apartment, which has been immaculately refurbished to take care of every holiday need. The terrace is the icing on the cake... perfect for appreciating every mood of the lake and surrounding mountains... a brilliantly sunny spot to enjoy breakfast each morning. Ideal! Magnifecent views! Beautifully renovated clean home. We could not have picked a better place to stay on Lake Como. Argegno is such a charming and authentic town. I can't say enough wonderful things about the view from this location. The patio is very large and we enjoyed sitting outside every morning and evening. The house has been completely renovated and is clean and comfortable. They have thought of everything you could possibly need (even a pair of binoculars). Although we ate out most of the trip the kitchen is fully equipped to be used. Having 2 bathrooms was a bonus for us since we traveled with another couple. Everyone had their own space. The ability to wash and iron clothes is very appreciated as well. The property managers were a joy to work with. They communicated everything so well. I was concerned about not having air conditioning but as hot as it was it really was fine. Thankful you had fans to use, it made it comfortable. The town is definitely within walking distance however as it is mostly all stairs, coming up provides you with a good daily workout. We fell in love with the town and plan to come back again. We would stay in the same place in a heartbeat. You can't go wrong at Bella Vista Sul Lago. Grazie mille!!!!! Clean and spacious, with great views and location. We stayed here over the winter holidays with a group of 5. Upon getting to property, we were pleased with how easy it was to park in the covered garage. We only had one car, but there could be room in the garage for two smaller cars, and there is also parking available off-street right outside the property. When we got into the house there was a small gift waiting for us with Prosecco (score!) so we could celebrate after our long day of travel. I was pleased that the house was very clean and organized upon our arrival as well. The home is quite large compared to others we looked at, and with our group of five we never felt like we were in each other’s ways. All of the rooms have gorgeous views of the lake; I especially love that it is north-facing so we get to see the Alps in the background. The kitchen was easy to cook/clean in, with a gas stove and oven, large refrigerator, and dishwasher. There is also a washer/dryer on the downstairs floor, which we used once and was easy to figure out. It got fairly cold outside during our stay, so I was afraid that the house might get cold and uncomfortable. I was delighted though with how well the radiators were able to heat the rooms, nobody felt too cold the whole time we were there (not even in the loft!). Being the winter, I didn’t expect too much to be open in town since Lake Como is fairly tourist driven. However, while there were a few businesses closed for winter, it seemed like most of Argegno was still open. There are lots of locals who live in the area, so restaurants still fill up in the evenings (although we never had trouble getting a table). I highly recommend Bistro Argegno if you’re looking for a good place to get a drink/appetizers. Café Columbo is also great, and is the go-to place for bicyclists during the day and locals in the evenings. Both of these restaurants, as well as the rest of downtown Argegno, are only a 5-minute walk from the property. We also traveled to some nearby towns. Como is not far away (20ish minute drive), and is where we got most of our groceries (at a store called Bennet). The ferry has limited hours over the winter but we did take it once to Menaggio which was lovely. If you’re feeling more adventurous, you can drive 2 hours to Tirano and take the train into Switzerland. The trip is gorgeous, but is definitely an all-day event. Overall our stay at Bella Vista sul Lago was amazing, and I cannot wait to stay here again in the summer months! A short drive to the quintessential Italian town of Como. Guide books tell you it is famous for Italian silk, however, we prefer its lake front views, pretty piazzas, 600 old churches, gelato shops (nocciala is our favourite! ), alfresco dining and shopping for sumptious Italian delicacies! 25 minutes to the Swiss border for designer outlets in Fox town. 45 minutes to Milan. 20 minutes to the lakeside town of Menaggio from where you can take a ferry to Bellagio. for the freshest seasonal ingredients or treat yourself to one of Zoe's delicious home made icecreams. The village is home to all amenities from bank to chemist, post office to cafes and bars not to mention a fine selection of resturants from fine dining to rustic italian fayre. Pensavo meglio ( wine bar ) is well worth a visit. Great wines!! Out and about the lake, choose from Villa Carlotta in Tremezzo (20 minutes by car). Beautiful gardens in many styles with lake views to die for! 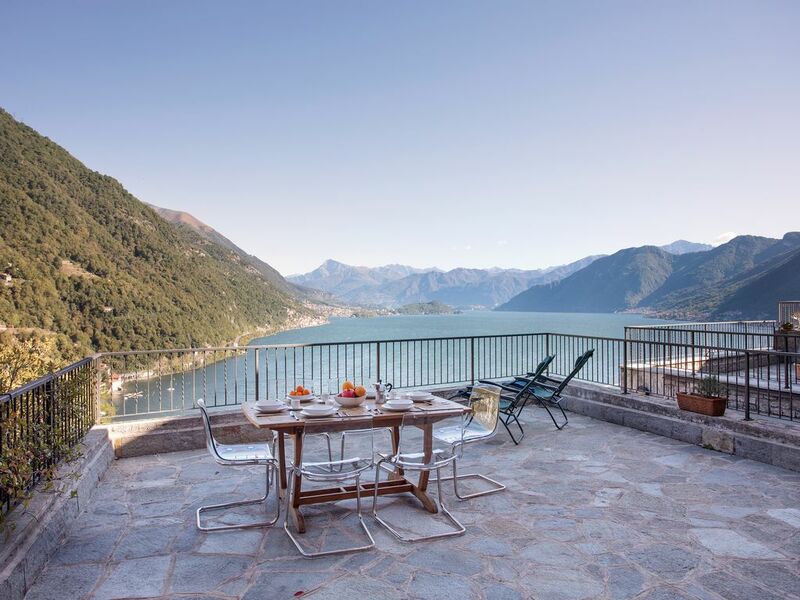 Villa Serbollini in Bellagio with unrivalled panoramic views is a fantstic day out. Bellagio itself is a favourite for holiday makers with it's cobbled streets and unbeatable views. Do not miss Villa Babinello in Lenno. If you wanted to propose to somebody I have yet to see a more romantic spot! Walk to the villa or take the private boat (6 euros) from Lenno lido (20 minutes by car from the apartment). The villa and it's majestic gardens overlook the rich blue waters of the lake. Simply divine. No wonder the new James Bond film was shot at this Villa! (May 2006) You can also relax on the golden sand beach at lido di lenno or take a dip in the lake. for an idyllic lakeside walk, a favourite past time of ours for a Sunday stroll. Menaggio, with it's palm lined walkways is another pretty lake village worth exploring. Many boat activities from windsurfing to sailing are available on the lake as well as other water sports. Mountain bikes are also available for hire if you wish to venture into the vast mountains that surround the lake.